Audient's latest analogue console has turned the DAW-controller concept on its head, taking advantage of mainstream DAW software to provide fader automation and recall. Audient are British manufacturers probably best known for their excellent ASP and ACS 8024 studio mixing consoles, as well as a host of very well‑designed analogue outboard equipment, including the Black Series modular signal processing rack, ASP510 surround monitor controller, Mico compact mic preamp, Sumo summing amplifier... and much more besides. All of these products boast solid, professional, high‑end performance, while also being attractively priced in comparison to their competition — so while they may not be affordable for everyone, they generally represent excellent value for money. The most recent addition to the Audient fold is their Zen console. A simplistic description would be that the Zen is essentially a cut‑down ASP8024: it has lost all of the channel EQ, some of the auxiliaries, and (optionally) the mic preamp section too — but some DAW control facilities and moving‑fader automation have been added in. 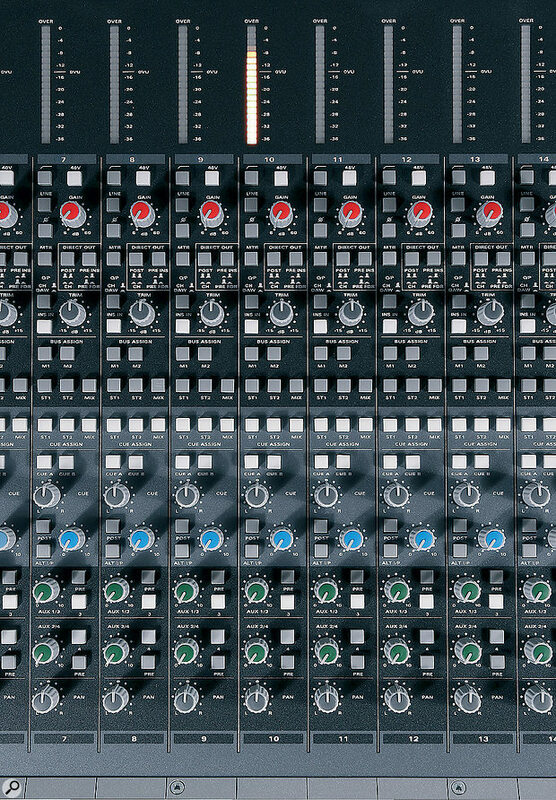 At a basic level, the Zen serves as a very competent, high‑quality external summing mixer, with all the monitoring control facilities you could possibly want, but if the optional mic‑preamp section is installed it can also make an excellent no‑frills tracking and recording console too. However, its real strength lies in the optional moving‑fader automation system, enabling fully automated analogue mixdowns within a sensible budget for the serious project studio. It's worth noting that the fader‑automation package relies entirely on a DAW system to provide the fader data record/replay facilities, but since most studios use DAWs as the recording platform by default these days, this is actually a very efficient, cost‑effective method. While this approach means that the Zen also offers some simple DAW-control facilities, it's important to understand that it isn't a fully‑fledged DAW controller. It doesn't offer panning control, for example, and certainly isn't intended to replace the likes of a Mackie HUI or a Euphonix Mix: that's just not what it was designed to do. The DAW control features basically boil down to the moving‑fader and channel‑mute automation, and transport controls. Also worth bearing in mind is that the Zen doesn't have USB or Firewire connectivity built in to integrate directly with your computer, and it includes no A‑D/D‑A converters for the channels: it's entirely analogue in that respect, and you'll still need an external multi-channel audio interface to hook the console up to the DAW. However, a master stereo output A‑D interface is available as another user option. 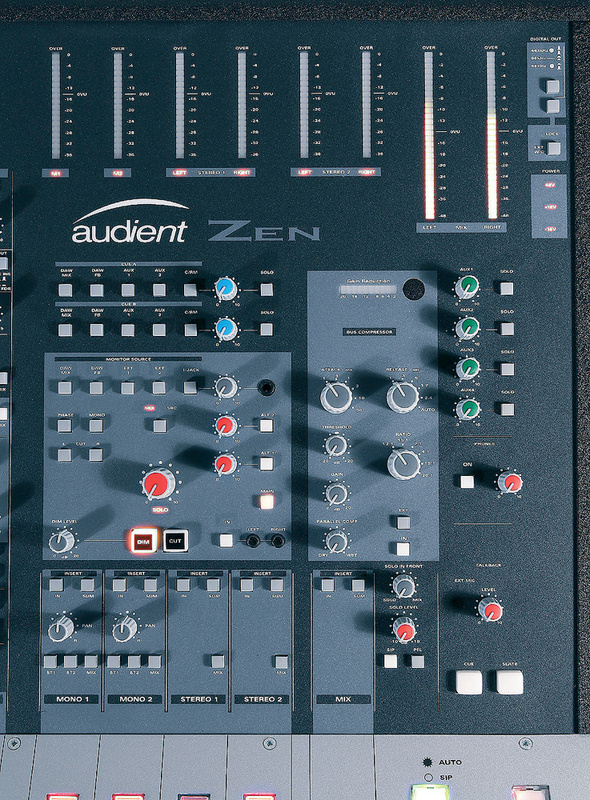 The Zen is a relatively compact, one‑size‑fits‑all, 16‑channel mixing desk. The channel, group and main faders are all 100mm designs, which (along with large illuminated Safe, Solo and Cut buttons) are mounted on a horizontal panel that includes a plush arm-rest, while the DAW transport controls are located to the right‑hand side. The bulk of the console's controls and metering is arranged on a steeply raked panel rising up behind the faders, making it very easy to see and reach everything. The array of push-buttons on each channel strip gives an indication of the extensive and flexible routing options of the Zen console. Every input channel features two electronically balanced line inputs ('Line' and 'DAW', both presented as rear‑panel XLRs), and the architecture has the capability to run two separate signal paths through the channel if required, thus doubling the number of available mixdown channels. If the mic preamp option is installed at the top of the channel strip, under the channel bar‑graph metering (adding another XLR input socket and switches for phantom power, a 12dB/octave, 75Hz, high‑pass filter and polarity inversion, plus a 6‑60dB mic gain control), the mic input signal can be selected as an alternative to the line input. The mic preamp is identical to the excellent design used in the larger Audient consoles and outboard products. Each channel also boasts an impedance‑balanced insert send and separate, electronically balanced return (both on rear‑panel TRS sockets), with an 'insert active' button to enable outboard equalisers or compressors to be patched in when required. In addition, every channel provides an electronically balanced direct output (with a very healthy 27dBu maximum output level), which is intended to feed the DAW when recording. A pair of push buttons allows four options for its source selection: direct from the Mic‑Line input stage; after the Mic‑Line/DAW selector switch and level-trim control (but pre‑insert); post‑insert point; or after the main fader and cut switch. There's considerable operational flexibility in these options, matching the versatility of many high-end consoles, with a variety of practical possibilities including ultra‑short signal paths, compressing 'to tape,' fader‑riding while recording, and so on. The channel Solo button operation depends on the console's global configuration, and can serve as either a stereo after‑fade or mono pre‑fade listen, or as a true solo‑in‑place system. For the AFL/PFL modes, the pre‑ or post‑fade channel signal is sent to a separate monitor bus and auditioned independently of the main mix outputs, although a nice additional feature, called 'Solo‑in‑Front', allows you to blend a proportion of the main stereo mix in with the AFL/PFL signal, to allow it to be auditioned in context. If the console is configured for solo‑in‑place operation, the main mix bus is monitored all the time, and pressing the channel solo button leaves that channel unaffected while all the others are muted — and this 'destructive soloing' clearly does affect the main mix-bus outputs! Every channel also has a 'Safe' button which can be used to prevent the channel being muted when another channel is soloed, which allows reverb returns to still be heard, for example. Again, these are all typical high‑end console functions. The 20‑segment bar‑graph meter at the top of the channel strip can be switched to show the signal level either after the mic‑line input stage or going to the direct output. It's worth noting that these bar‑graph meters are calibrated in digital style, with 0dB at the top and ‑38dB at the bottom. A 0VU mark at ‑14dBFS conforms to the EBU standard of 0dBu = ‑18dBFS (assuming that 0VU = +4dBu). The channel input signal can be panned and distributed to any of two stereo groups, two mono groups, or the main stereo mix bus. It can also be routed to one of two stereo Cue buses and two mono aux sends (switchable to buses Aux 1 or 3 and 2 or 4, each send with its own pre-/post‑fader switching). The stereo cue signal is normally derived directly from the mic‑line input path and switchable pre‑ or post‑fader. Alternatively, it can be sourced from the DAW input instead, if required, and as the Cue send control can also be panned and routed to the two stereo groups and stereo mix bus, this provides the second mixdown path capability. As a result, the console can accommodate up to 32 inputs on mixdown and/or can be operated as a 'pseudo in‑line' console, with dual‑channel (mic‑line) and monitor (DAW‑Cue) signal paths in each channel strip. There's even an input 'flip' switch to swap the mic‑line and DAW inputs between the channel‑fader and cue signal paths. The two mono groups are equipped with an impedance‑balanced insert send and electronically balanced return, but this time a 'Sum' button is included, which allows the return signal to be mixed (at unity gain) with the send signal, effectively adding yet another input for mixdown and, perhaps more usefully, making it very easy to set up parallel-compression configurations. An electronically balanced post‑fader group output (+27dBu maximum output level) is also provided on the rear panel. The mono group output can be routed and panned across the two stereo groups and main mix bus, and both stereo AFL and mono PFL facilities are provided, along with a bar‑graph meter monitoring the signal level feeding the buses. The two stereo groups have exactly the same facilities (albeit with stereo insert points), except that the output can only be routed to the main stereo mix bus (and rear‑panel post‑fade output sockets). All four group faders have 10dB of gain in hand, like the channel faders, and the same solo and cut buttons, but lack the channel's solo‑safe buttons because they are immune from solo muting; it would be pointless muting the groups when soloing channels which may well be routed through the groups, of course! The main stereo mix bus starts out much like the stereo group, with the same stereo insert‑point facilities and sum button (allowing the output of another external mixer to be introduced to expand the total number of mixed signals, if required). The signal is then routed to a stereo bus compressor, which is derived from the ASP8024 console's bus compressor. This has all the usual controls: threshold, ratio (from 1.2:1 up to 20:1), gain, attack and release (with an auto recovery mode), and a gain‑reduction bar-graph — but also a wet/dry control to enable instant parallel‑compression effects to be dialled up. It can also be bypassed, and its inputs and outputs are then made available directly on rear-panel connectors, enabling it to be patched into a stereo group or used for other external signal processing. The mix‑bus signal path continues from the bus compressor to the master output fader (calibrated with unity gain at the top) and then on to the actively balanced main outputs on the rear panel, as well as to the monitoring section and an optional A‑D card. This can generate sample rates of up to 96kHz (192kHz given a suitable external word clock) and output AES3 and both coaxial and Toslink S/PDIF formatted signals. Each of the four auxiliary masters is equipped with a rotary master-level control, an electronically balanced line output, and a solo button that routes the pre‑ and post‑fade signals to the AFL and PFL buses — so you can easily check what's leaving the console's aux buses. The stereo Cue output facilities are a little more complex, but feature the same rotary master-level control feeding electronically balanced outputs, with a solo button to check what's leaving the console. The extra complexity comes from the provision of additional input sources to the stereo cue bus, each with its own on‑off button. The extra sources are: DAW Mix, DAW Foldback (these two being physical external balanced inputs), Aux 1 master, Aux 2 master, and Control Room. The DAW Mix input is intended to accept the principal stereo in‑the‑box mix output from the DAW, while the DAW foldback input is intended to accept a separate dedicated monitor, headphone or foldback mix from the DAW — although both can also be used as ordinary two‑track returns. The aux monitoring is obvious and the control‑room button routes whatever the engineer is listening to back into the cue bus for the studio talent to hear. The master section includes controls for the built‑in bus compressor, which usefully includes a wet/dry control for parallel compression applications. The Zen's talkback facilities are simple but equally flexible. There's a built‑in electret mic (located in the bus compressor section of the front panel), along with provision to accept an external mic signal via an XLR (with phantom power, if required) located under the front arm-rest. The controls comprise a rotary gain knob (20‑55dB) and two momentary push buttons. The first (Slate) routes the talkback to all mono and stereo groups and stereo main outputs, while the second (Cue) routes the talkback only to the two stereo cue buses. Pressing either talkback button attenuates the monitor speaker outputs automatically, to optimise audibility and prevent howlrounds. The monitoring sections of Audient consoles are always comprehensively equipped. The default feed to the monitoring chain is the main stereo output, of course, but a number of alternative sources is also available. A 'Src' button selects the output of a five‑way external input matrix, with provision for the DAW Mix and DAW foldback inputs already mentioned, two more balanced external inputs, and an unbalanced 'i‑Jack' input (with its own rotary level‑control), which is intended to accommodate an MP3 player. Usefully, these five external sources can be monitored individually or as a mix. The output from the Mix/Src button is overridden when any of the solo buttons is pressed, of course, and two more buttons in this section determine whether the console operates with global AFL or PFL, Solo‑In‑Place or Solo‑in‑Front modes. As I mentioned earlier, the useful 'Solo‑in‑Front' option allows a user‑adjustable proportion of the main mix to remain audible in the background when channels are soloed, and a solo level trim control provides ±10dB of overall level tweaking. The selected main mix, external input, or solo monitoring signal is displayed on another long stereo bar‑graph meter (this time with 30 segments and a 10dB wider dynamic range than the channel and group meters) and routed to the speakers. The usual monitoring controls are provided, including a left‑channel polarity‑reverse button, mono, dim (with user‑adjustable level), left and right cut switches, and an overall speaker‑cut button. I was pleased that the configuration of the mono and individual cut switches allows true mono monitoring on one speaker, as this gives a far more realistic impression than a phantom mono image. The main rotary volume control can be bypassed by pressing a 'Ref' button, which sets a fixed (but user‑adjustable) reference monitoring level instead: another excellent idea. The monitoring signal can be routed to any of three electronically balanced outputs to feed the main speakers and two alternative sets, the latter with individual level trims. There's also a single headphone output, with its own volume control and an on‑off button. Although there's no obvious provision on the Zen for working with, or monitoring in, surround sound, it certainly has been thought about and can be done! The monitoring side is taken care of by the inclusion of a nine‑pin D‑sub socket on the rear panel, which provides integration of the Zen's solo and dim control signals with the company's own ASP510 surround monitor controller. Surround mix outputs can be generated fairly easily by using the channel fader and pan to feed one stereo group for the front left‑right pair, with the channel Cue send and pan to feed the second stereo group for the rear left‑right pair. The channel auxes can be used for centre and LFE feeds. Okay, so it's not as intuitive as a console with dedicated surround‑sound panning facilities, but it's certainly a workable solution for occasional use. The rear panel hosts all of the I/O, including MIDI ports (used for fader automation) and the optional mic preamps and digital output card. There are several ways of assessing the Zen console, and the simplest is as a straightforward line‑level mixdown console with built‑in monitoring. In this context, it works very well indeed, and although some might miss the inclusion of channel equalisation, I'm sure just as many would prefer the cost benefit of using their favoured DAW plug‑in EQ instead, or classic outboard devices hooked up via the very competent balanced insert-points. Everything about this desk feels smooth, solid and reliable, and the motorised faders feel sturdy but are pleasurable to use. The considerable flexibility in signal routing and control easily rivals the best in the business, as do the tech specs, which are precise and workmanlike, with good solid engineering performance throughout. The frequency response is quoted as 20Hz to 20kHz (±0.3dB), while THD and noise is less than 0.005 percent (at 1kHz) and the mic preamp's effective input noise (EIN) is better than ‑127.5dBu (20Hz ‑20kHz, 150R source). Bus noise with all inputs routed is better than ‑80dBu, which is very creditable. On the subject of sound quality, this Audient design (like its sibling 8024 consoles) doesn't impose its own character, but instead allows the source material to shine in its own light. This may not appeal to those potential users who want their analogue summing to colour the sound in some way, but it certainly will appeal to many others, who prefer to shape the tonality of their material with mic and preamp choices rather than the mixing console. If the optional mic preamps are installed, the console also becomes a very efficient recording front-end. The mic preamps are very clean and quiet, with plenty of headroom and a neutral tonality: they're just the same as those in the 8024 console and Mico preamp. With this console configuration, the Zen would be ideal in a technical training situation — such as at a music college, for example — as it would allow a wide range of recording situations to be captured to a DAW using a variety of analogue console operating techniques, and then remixed in a very elegant and simple‑to‑understand way, too. The next level, of course, is to add the optional fader automation (see 'Zen & The Art Of Automation' box), and this is where the console really starts to blossom — once you have grasped the working concept, which initially will be a little unfamiliar to most. Fortunately, the manual is excellent, with lots of very clear diagrams and explanations about both the interfacing and operation of the console itself, as well as detailed step‑by‑step guides on configuring and fine‑tuning Logic, Pro Tools and Cubase/Nuendo for automation. The optional automation package is certainly effective and efficient, and obviously makes it far easier to create, develop and manage externally summed mixes on the Zen. If viewed in isolation in that context (as an automated analogue console), the Zen system is a sure‑fire winner, no question. However, I fear that younger engineers who have grown up with comprehensive DAW controllers as a standard part of their routine working practice will find the lack of panning automation and the limited DAW control facilities a little frustrating and restrictive. While I have those few reservations about the practicality and potential popularity of the Zen's DAW control functionality, the console itself is exemplary and will undoubtedly serve well in a wide variety of applications — not least in an educational situation, where it would tick all the boxes. Clearly, this is a very versatile, manually controlled external summing mixer and, with the optional mic preamps, it makes a superb high‑quality tracking mixer too. In both cases the built‑in comprehensive monitoring is a significant bonus, and the sonic quality of the audio path maintains the very high standards that we've come to associate with Audient consoles. The inclusion of balanced insert points and masses of headroom demonstrates clearly that there's no corner‑cutting here. In short, then, the Zen can be a number of very different things, and satisfy many different working situations — and its strength lies in its flexibility and configurability. There are several high-end consoles that combine analogue audio and MIDI DAW control facilities, such as SSL's AWS900 and the Neve Genesys. The SSL Matrix is perhaps nearer in concept and price (but still considerably more expensive), but it offers neither the mic-preamp option nor the built-in compressor. Far lower in price than the Zen, the Allen & Heath Zed R16 is the only directly comparable console, but it takes a radically different approach: it provides similar MIDI fader-automation facilities to write automation into a DAW, but its 60mm faders aren't motorised, and so you can't recreate an automated analogue mix through the console. It has the advantage of very comprehensive channel EQ facilities, Firewire audio interfacing, and a dedicated MIDI control section, equipped with both rotary and linear controllers and assignable switches, all of which can be used to send MIDI data to the DAW — but the Zed R16 is essentially a conventional passive analogue console with outgoing MIDI control facilities added, whereas the Zen is a true automated analogue mixdown console. The Zen automation option adds moving-fader and mute automation to the console (not panning), but relies on using a DAW to record and replay the necessary MIDI data, which is formatted to the Mackie HUI protocol (with eight‑bit or 256‑step precision). Basically, the DAW has to be configured to record the console's automation data on 16 'dummy' audio tracks within the current audio project (one for each automated fader). The fader automation can't be stored on the actual DAW audio tracks, because if it was, the DAW's own mixer faders would move up and down along with the Zen's, providing a double fade effect! It's possible to configure and route the fader and mute automation data from the console to operate up to 16 existing DAW audio tracks, if required, using the Zen console as a dumb controller. However, there's no provision on the console for fader shifting or banking, and no rotary encoders, so the functionality is very limited. The use of the familiar HUI protocol ensures that the Zen system is compatible with pretty much any DAW on the market, although Audient say they've optimised the system for use with Logic 8, Pro Tools 7.4 (LE and HD), Cubase 4 and Nuendo 3, and any later versions of those software platforms. As the Zen is a 16‑channel console and uses the HUI protocol, it must be linked to the DAW via two MIDI ports in each direction: the first pair of in‑out MIDI sockets carries data for channels 1‑8, the second for channels 9‑16. These MIDI sockets are on the rear panel of the console, and simply need to be hooked up to an appropriate DAW interface. DAW transport instructions are also passed over these MIDI ports, with large buttons on the console's right‑hand cheek panel for Stop, Play, Record, Rewind and Fast Forward. The precise functionality of the automation controls (for example, what happens if you press the fast‑forward and rewind buttons repeatedly, or double‑click the Stop button) depends on the specific DAW software in use. There are also two, as yet uncommitted, buttons which will probably be allocated functions in a future firmware update: Audient are awaiting user feedback and suggestions as to the most appropriate functionality to provide here. Firmware updates can be implemented over the MIDI interface from the DAW using a utility program called Zenudu. A master Automation on‑off button is provided to isolate the moving‑fader automation from the DAW, if required, although this doesn't affect the transport controls at all: they're always active. Another button in the transport panel temporarily changes the role of the channel Safe buttons, so that instead of isolating the channels from destructive solo‑in‑place monitoring, they now stop the associated channel from reacting to automation data — and both the SIP‑safe and automation‑safe conditions are remembered, so you can drop a channel out of the automation while still having it isolated from the SIP monitoring, and vice versa. However, one slightly risky aspect of this memory is that it is retained even if the console is powered down, so you could power the desk up and start working without realising that some channels are still in automation or SIP‑safe modes, depending on which safe setting the desk is displaying. The automation data system can be configured in one of two ways. With the Zen console set up as the master, all fader settings, moves and mutes are sent to be recorded in the DAW as automation moves on the corresponding dummy tracks. This mode is useful for setting up an initial mix pass, or for punching in a complete new mix setup (perhaps for the chorus change, for example). The other mode is with the DAW as the master, and this is the mode that best suits fine‑tuning a mix, as the console follows the stored fader and mute data, but also allows updates on individual channels according to whatever automation update mode (Touch, Latch, Read, and so on) is in force in the DAW. In most automated mix applications, the Touch Update mode (or equivalent) is the most appropriate, so that touching a channel fader on the Zen console automatically puts the corresponding automation data track into write, storing the new moves and positions. When the fader is released, the software writes a smooth transition back to the previously recorded data. Switching an automation-data channel subsequently into Read mode allows the motorised faders on the console to track the data, while preventing the automation being updated if the faders are touched accidentally. However, all a DAW's usual automation modes, such as Write, Latch and Trim, can be used as and when necessary, to suit the way you prefer to work. Since the fader automation system relies entirely on the DAW software, its functionality is also entirely dependent on the DAW, although it's fair to say that most systems provide very similar options and controls. The review console was set up with Logic 8, and it seemed to work very well indeed. Writing automation data (fader moves and channel mutes) was fast and intuitive, and replayed mixes tracked accurately and smoothly, and proved easy to fine‑tune and polish. There was no fader juddering or indecisiveness, and even stupidly rapid and repetitive moves tracked perfectly. I can anticipate that some frustration might creep in occasionally at not being able to automate the group and main output faders, but that's just something that has to be accepted as a necessary compromise in a console at this price. Configuring the DAW to record and replay the MIDI data to and from the appropriate dummy tracks is a little mind‑bending at first, but this only needs to be done once and can then be stored as a standard template. The dummy tracks can also be hidden away fairly easily in most systems if you don't want to see the extra clutter of data tracks on screen. The transport controls are fast and responsive, although I missed the provision of a jog/shuttle wheel, and some hardened DAW controller users will undoubtedly miss the ability to control the much wider range of DAW functions that they've come to take for granted. In fact, I see this as the most significant issue with the Zen. It relies on the user's DAW for the audio sources, most signal‑processing requirements and the automation functions, but it doesn't provide comprehensive DAW control in return. Although many users are still quite happy to drive the DAW plug‑ins and other functions with a mouse and keyboard, an increasing number are becoming used to using a DAW controller of some kind, and that means doubling up on functionality to some extent. In some DAW programs that could be a problem, as combining multiple HUI controllers can get pretty messy and complicated. Basic (without mic preamps and moving faders): £7676.25$12665. 16 mic preamps, without moving faders: £8826.25$14565. Moving faders, but no mic preamps: £9401.25$15515. Moving faders and 16 mic preamps: £10,551.25$17415. Stereo digital output option: £287.50$610. Prices include VAT. Same audio quality as the ASP8024 console. Sophisticated signal routing, with dual channel paths. All XLR/TRS interfacing and balanced I/O throughout. Comprehensive monitoring and talkback facilities. Optional automation package, mic preamp and master A‑D interface. No in-built DAW interfacing: no Firewire or USB audio connectivity. A traditional analogue console derived from the proven Audient ASP8024, but in a simplified form and with an optional fader automation package that just happens to rely on the DAW for its functionality. It is not a DAW controller in the accepted sense, although there are some shared functions and facilities. The mic preamp section is optional for those who only require a mixdown console. FDW Sales & Marketing +1 608 227 2040.